Laurie looks into the ads. Can people eat healthy if they have just $31.50 to buy food for a week? Before she went shopping, Radovsky and her husband sat down and discussed what she would buy. They tried to rank the groceries in an order of what is essential for daily life and what is luxury. This was not easy, as her husband ranked coffee as essential but Radovsky said she would do without it. They both agreed that milk, bread, hard cheese, eggs, cottage cheese and potatoes are essential daily needs. They also agree that, to have a healthy diet, people have to eat at least two to three servings of fruits and vegetables a day. As Radovsky entered Cub Foods, she immediately heeded for the fruit section and bought apples. Instead of oranges, she bought grapefruits as they were on sale. Bananas landed in her shopping cart, as well. It was a real challenge for Radovsky to think about what she would take, to compare prices and decide what she could afford and what not. While strolling down the shopping aisles, she said that the real challenge would be not to have the possibility to return later and buy something that she missed. Normally, she just gets in the car and buys whatever she needs. Now she had to plan and think about what she was going to eat for the whole week. Radovsky expected not to miss a specific food item but rather to miss the spontaneity and possibility to buy when and what she wanted. 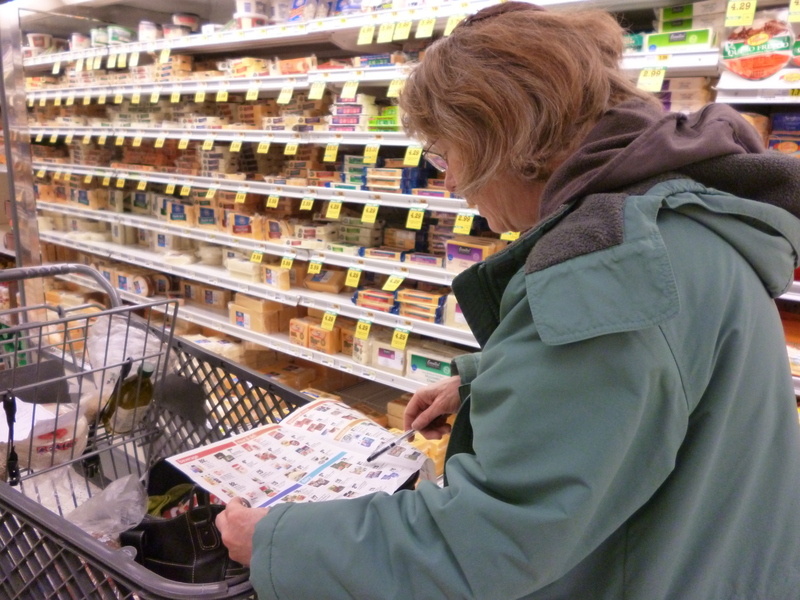 As a member of the Jewish Beth Jacob Congregation, it was a real challenge for her to buy kosher food and she said that she would avoid kosher meat during the week as it is too expensive. She wondered how Muslims and Jewish people who are on food stamps keep their specific diet and she recognized that living with a specific food budget could threaten your religious principles. Not only people observing religious dietary laws, but also people with diseases or allergies face big challenges on this restricted budget. For example, how can people with gluten intolerance buy specific more expensive gluten-free products? Radovsky cannot drink normal milk as she cannot tolerate the milk protein. So she has to buy the more expensive soy milk. To get a lot of protein, Radovsky bought beans and potatoes instead of pasta. She explained that pasta is a relatively low source for good protein and therefore should be replaced in a healthy diet. She said that good protein is essential for a healthy diet and is the basis for your energy. At the end of the shopping trip, Radovsky had managed to purchase a lot of good food, from frozen vegetables to bread to fruits. Although she had to leave luxury items, like rice crackers, at the check-out because she ran over her budget, she did manage to buy the beloved coffee for her husband. After one week of trying to live on a Food Stamp budget, some of the participants came together to share their experiences. Radovsky succeeded and this week changed her perception of her previous lifestyle. One week ago, when she brought her shopping home and wanted to put the food in the fridge, she recognized that her fridge was already crammed with bad food that sometimes was even expired. Through this experiment, she and her family became aware of waste and excessive food purchases they used to have. Now, the family decided to live from a specific food budget each month to save money and food. “It is a slap in the face of poor people that we are throwing away so much food,” Radovsky said. Not only did she succeed in living on the food stamp budget, she also managed to eat a healthy diet. She could serve two to three servings of fruits and vegetables per day. However, she admitted that this way of cooking is more time consuming and she could now understand why Mc Donalds sometime looks kind of attractive. Her big piece of advice for anyone is to buy food that is nutrient dense. Nutrient dense food has a lot of nutrition per calorie. For example, pasta is not as nutrient dense as potatoes, which have vitamin C, some protein, and more fiber. For people who are on a budget, it is even more important to not waste their money on food that will not give them the nutrients that they need. During the week, Radovsky ate oatmeal for breakfast and made different bean dishes for dinner. It did not get too boring because she used different spices to flavor the beans. Using spices to flavor meals is a great possibility to guarantee some variety even though you have to eat beans four times a week. Her second tip was food co-ops, which sell spices and herbs in bulk, so people can buy just a few teaspoons at a time for not too much money. Radovsky was very thankful to have this experience and is going to write a handout for her patients with all the tips she came up during this remarkable week.